As we’ve discussed before, there is an actual spirit of poverty—a demonic force—in the world that loves to rob and steal from God’s people. 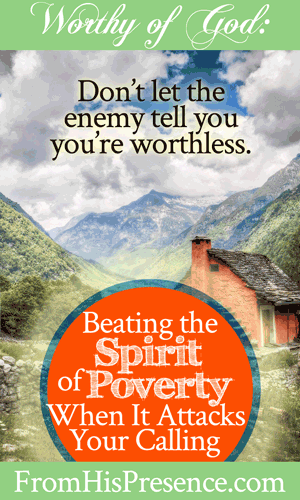 Today, we’re going to talk about how to beat the spirit of poverty when it attacks your calling. This is part 3 of the Worthy of God series, about awakening to dreams that are big enough. Read part 1 here and part 2 here. The spirit of poverty plunders Christians not necessarily by taking away things, but by influencing your thought patterns. If you want to carry out dreams that are worthy of God, you’ll need to take proactive steps to beat that foul spirit. that your net worth should demonstrate worth-lessness. But you know what? The devil and his minions are liars, and none of those evil whisperings are true. The TRUTH is that you have immeasurable, inestimable value and worth. FOR YOU. Yes, YOU are worth that much. Jesus paid the price for you with something far more precious than money. He poured out His life for you. He freely gave every drop of blood in His innocent body for you. You were worth it to Him then, and you’re worth it to Him now. The thing is, blood was the currency that paid for sin. Blood bought forgiveness and re-introduction to God’s presence for everyone who desires to access that presence through Christ. And now that the price of forgiveness has been paid, additional blood is no longer needed for most transactions. It’s true that blood is still a required currency for some transactions. Freedom, for instance, is unfortunately usually purchased with blood. The shores of Omaha Beach and the halls of history prove this to be a fact. But blood is not the general currency that pays for lesser things. You don’t purchase gasoline at the filling station with blood. You don’t buy your lunch with blood. You don’t purchase groceries at the grocery store with blood. Why? Because these are lesser things. They do not require paying the ultimate price. Nowadays, we pay for lesser things in good old cash money. Money is the currency, the method of exchange, by which we benefit from other people’s experience, labor, and knowledge. If God thinks you were worth dying for–and He’s the One who created both your time and your testimony–then other people can sure as shootin’ pay you with money for your time, your message, and your labor. Nothing worthwhile comes without exchanging one thing of value for another thing of equal or greater value. See, the enemy would love for you to think you have to give everything away. I did that once with a makeup home-sales business, and I went out of business really fast. You can’t make money when you sell everything at cost and then give away inventory as free gifts. The enemy would also like for you to think that you, your efforts, your experience and wisdom, and the price you paid to get that wisdom are worth nothing. It’s a trap; don’t fall for it. Your experience, expertise, knowledge, skills, and time are valuable. The enemy will also try to convince you that no one will be willing to pay for your time, labor, and expertise. That’s a lie also. If you do something well, people take notice and someone will want what you have—and be willing to pay for it. Everyone doesn’t have to want what you have; you just need to find out who your people are and work with them. You can beat the spirit of poverty. You can beat it when it attacks you and your calling. You can beat it when it attacks anything at all, really. relationships, and more–for you and for me. Learn how to recognize it. Learn how it operates. Allow Holy Spirit to expose it in every area it may be operating in your life. In an article I wrote awhile back, called 7 Signs of the Spirit of Poverty, I exposed seven ways you can tell if this thing is operating in your life. And along with each sign, I taught how you can beat that thing and kick it out of your life. The evil spirit of poverty would love to rob you of the joy and blessing that accompany your calling. Don’t let it. The blessing of the Lord makes rich, and He adds no sorrow to it. Does this post resonate with you? Is Holy Spirit speaking to your heart? If so, please leave a comment below. I love hearing from you! I am definitely being attacked by the spirit of poverty, thank you for that prayer I will begin immediately. Going through this divorce is very hard and there are many decisions that need to be made and I am not used to making them. Pray that I would make wise decisions, this affects the rest of my life and I would like to have love again and I know that exact right person is looking for me. I’ve been mourning my marriage for two years now and I’m so ready to be happy again. Thanks so much Jamie, your an angel. Sue, I’m so sorry. I have been praying for you and will continue to do so. Abba Father restores and He is ready to make all things new. I don’t know what that will look like, but I do know that He cares for you. He loves you with a wild, outrageous Fatherlove! Grace and peace and many blessings to you today, sister. I just finished reading the 7 signs of a poverty spirit. No wonder I haven’t been able to dig my way out! I am guilty of all of them! I never used to be this way! Yuck! 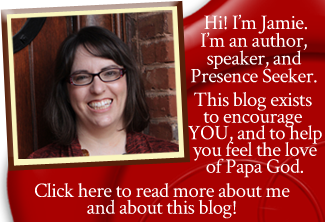 Thank you Holy Spirit for using Jamie as your mouthpiece! Thank you for this divine connection! I literally stumbled across you, Jamie. My tithing has been sporadic the past few years & I know better! If you don’t give your tithing, the enemy steals more than what your tithe would’ve been. I am now 50 miles from my church & I haven’t been able to attend like I should. It is 4 days after payday & I have just enough money for fuel to get me to work until my next payday. I’m making a stand today against this spirit of poverty! Can’t wait to share my testimony with you! I know all about that worthlessness and about giving away things. I sent off couple of articles I’d written this week and I pray for restoration in doing His will. Rebecca, I pray Papa would bless you in your writing career. It’s His will to prosper you in all things, and in everything to which you set your hand. Father, pour out on my sister all good things, in Jesus’ name.